There’s lots of resources for getting started with Jobs-to-be-Done interview techniques. Yet most of these apply to physical products. If you work in a software company, you might rightly ask how the hell this relates to your product. You can read up on why a person bought a mattress, but not why they bought a piece of software. These interview techniques will tell you to hone in on the emotional triggers around a particular point in time that led to a person “hiring” or “firing” a product. After conducting many, many interviews, we’ve found you can still apply the fundamental Jobs-to-be-Done interview techniques while adapting them to better suit the needs of software design. One of the first things you’ll notice about Jobs-to-be-Done interviews is an emphasis on “extracting the first thought” from a purchase or switching decision. For a physical product, this is easy – you can deep dive into the mindset and physical setting the customer might have been in during the time of the purchase. When did you start to look for another mattress? Where were you when you made this decision? Were you with anyone at the time? When it comes to software, it can be tricky to extract the “first-thought”. Asking “Was it raining on the day you signed up for the calendar app?” is unlikely to jog someone’s memory. We’ve learned the first thought can be multidimensional. Take enterprise software. 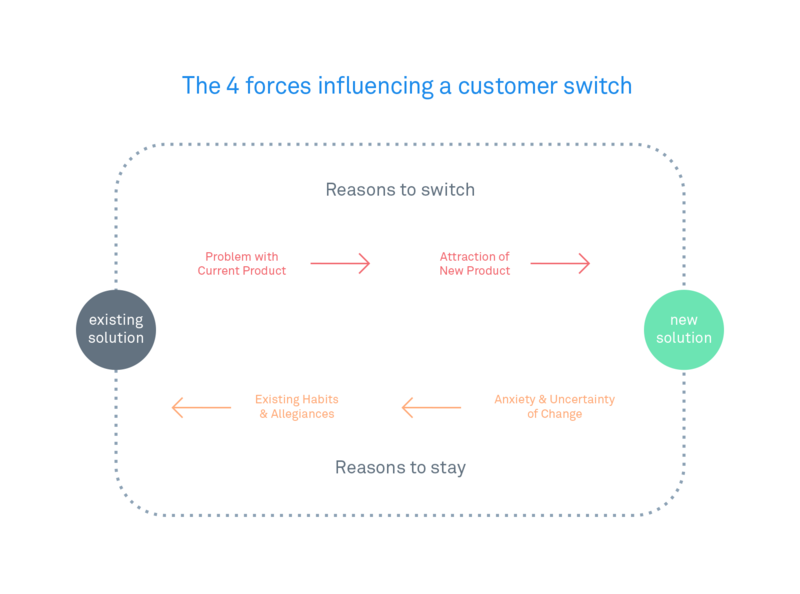 From a lack of budget, to a change in management, to multiple tools being used for one job, there are many factors why a company might switch to a new product. These factors can be used in your interviews – involve functional aspects from within a company, along with emotional triggers from that time. What tool were you using before you bought [software]? Were you also involved in buying that? What was it like working in [department] for [company] back then? Can you remember if anyone else was involved in the decision? What was their role in the company at that time? Can you remember how well the [old solution] was working? Was it just your department using it? The forces of progress (push, pull, habit, anxiety) are a way of understanding how people buy products. The consideration set involves the time in which a person (or company) is looking at all the possible solutions for a job they want to fulfill through a product. It’s during this time “active” or “passive” looking takes place. Active looking usually stems from a moment of particular frustration the person has been through with the product. Passive looking can be ongoing for weeks/months while the person is uncertain if the product is doing its job well enough. Once you figured out you wanted to buy a new solution, did you do much research to figure out which tool was right for your company? Were you the only one who was looking for something else at that time? Where did you first hear about the tool you picked? Can you recall how you came to purchase the specific tool you did? When you were looking around, did you (or anyone else) try out any other tools? What were they? How long did you look around before you clicked “buy” on the [tool’s] website? 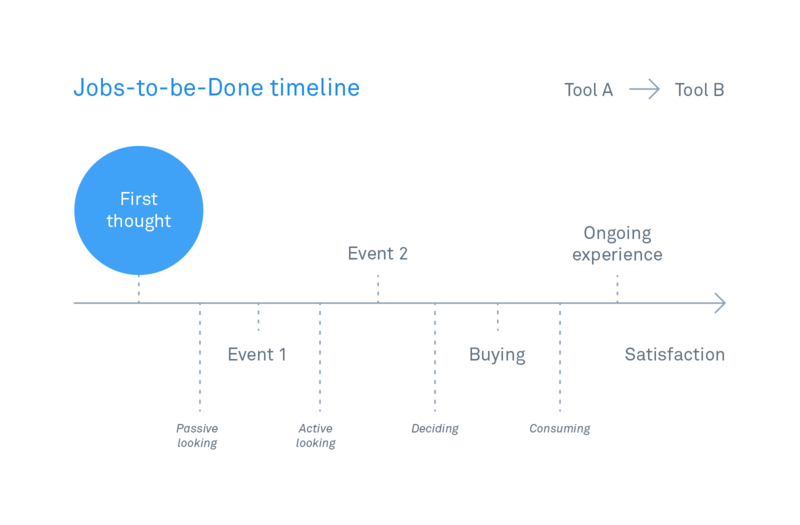 Creating a timeline of events helps bring the interviewee back through the journey of what brought them to purchase a product. We’ve discovered for software purchases, there are often multiple timelines at work. 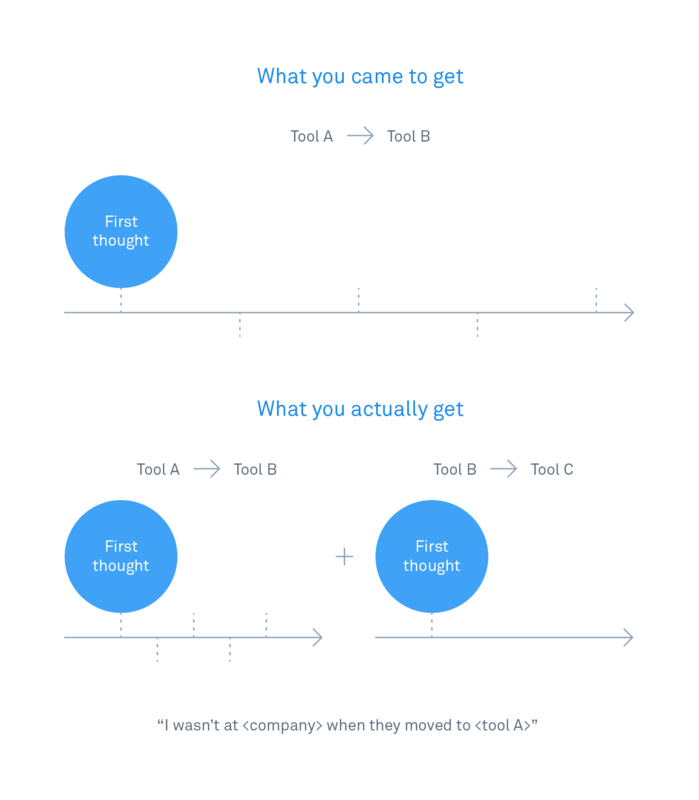 In the past, we’ve started interviews with the objective of uncovering why a company switched from Tool A > Tool B. We actually ended up with two timelines; one relating to why a company moved from Tool A > Tool B and then from Tool B > Tool C.
Once again, this is down to there being numerous people involved in the decision for buying software. You’re really looking for the right people to talk to, the main decision maker. There’s so many times you’ll hear: “I wasn’t at [company] when we bought [tool] but I’m the main person who uses it!”. What year did [company] move to [product]? Were you there at that point? Who decided to make that move? Are they still at the company now? What role are they in? Knowing who the other decision makers are will give you a broader picture where you need to innovate, and how you can support jobs your product is getting dropped for. Jobs-to-be-Done can be great for understanding why companies hire and fire products, and unearthing areas where you can innovate with your product. But remember what works for physical products does not directly translate to software products. 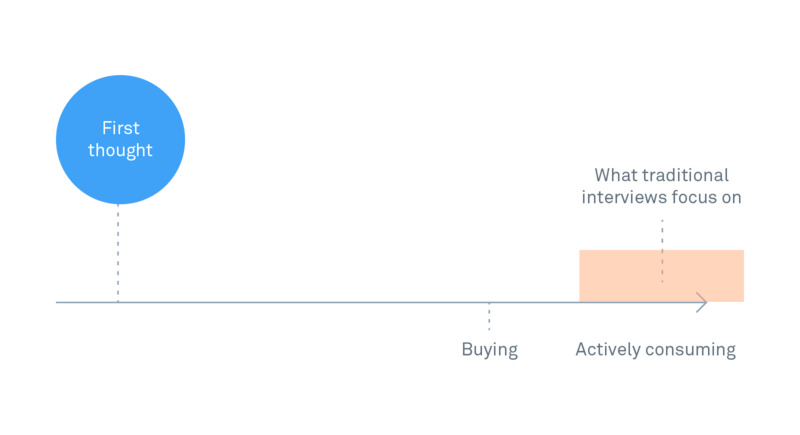 Purchases are multi-dimensional, have multiple buyers involved, and are spread across multiple timelines. By adjusting the interview techniques to your own needs, you’ll have a framework that can be applied to any modern software company. Our fourth book, Intercom on Jobs-to-be-Done, is a collection of our best thoughts and ideas on the topic. Get your copy today.